A work zone with a lane shift. 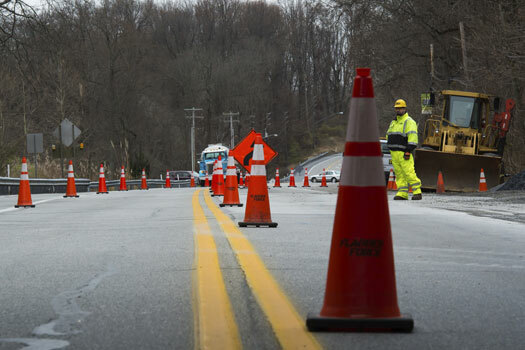 Certain jobsites require advanced flagging operations and traffic control, which is often the case in towns and cities where traffic arrives in multiple directions or where traffic from multiple lanes converges. Due to the volume, speed and complexity of traffic situations, multiple flaggers in close communication are required. Adequate signage and advances in traffic flow patterns help minimize traffic disruptions and keep construction crews safe while giving them the space and time to do their jobs. 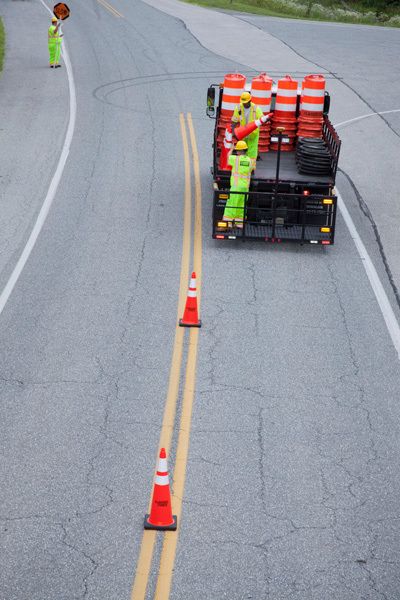 Advanced flagging operations include: multiple lane closures, busy intersections, traffic circles, highway ramp and merging lane restrictions, other situations where traffic volume, speed and roadway complexity render roadwork dangerous. No two jobsites are the same, we take the time and care to analyze the unique nature of your project and plan the advanced traffic control services that suit. Between Flagger Force employees: Our flaggers need to maintain constant contact — verbal or non-verbal. We train our traffic flaggers to be clear and concise in their communication. They’re always aware of what other flaggers are doing, which reduces the safety risk of miscommunication. For example, they must always know which lane of traffic if flowing at all times. Between flaggers and road construction teams: During more complex setups there are many moving parts from busy traffic patterns to the movement of multiple pieces of construction equipment. Clear lines of communication and standard procedures are reviewed during the pre-job safety discussion. Our flaggers are trained to carefully observe the movements of construction activity and efficient traffic flow through the work zone. In keeping communication open between our flaggers and your construction crew, we can adapt to changes and ensure everyone is aware of modifications to traffic flow and direction. Between flaggers and public traffic: To keep traffic moving safely through road construction sites, our flaggers use proper traffic control procedures and devices. They ensure they are highly visible day or night wearing new and clean personal protection equipment meeting or exceeding all safety requirements. Our flaggers are trained to make appropriate eye contact and verbal and non-verbal communication with the motorists and pedestrians to safety guide them through the work zone. When your road construction site requires advanced flagging operations, you can count on Flagger Force. We have the onsite expertise and experience to find a solution for any size operation. 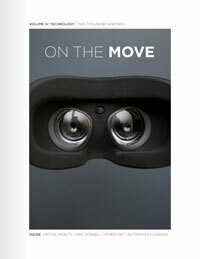 We deploy our best practices that are proven to keep traffic flowing as safely as possible. With a team of more than 1,600 employees and an average growth rate of 20% year, Flagger Force is a true industry leader in traffic control. Our safety driven culture pushes us to continuously improve our traffic control services and find new ways to deliver high-quality advanced flagging services.